Conquer Online set in the world of ancient China, is a free-to-play 2.5D MMORPG. Within the beautiful and opulent world of fantasies, you will control a strong and gallant hero, slaying outrageous monsters, completing dangerous quests and having the most fun in your life! The game made its first debut back in 2003, and with the massive player base and simple gameplay the game currently has exceeded more than 10 million registered users around the world. The fast-paced combat in game offers a myriad of fun PvP options. Most recently, the new class, pirate has been released. Players can enjoy Pirate vs Ninja in game. 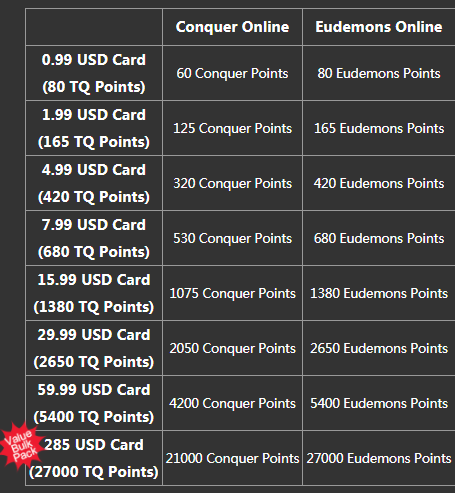 How to top up Conquer Online? 1. Visit TQ Payment Center webpage. 2. Select a game, select a group, select a server. 4. Type in your game account ID, and click on "Next". 5. You have successfully redeemed TQ Point Card to your TQ Digital Entertainment Account.